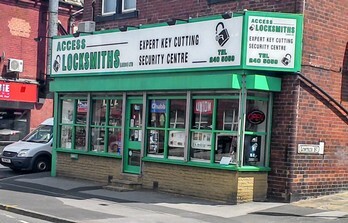 Services - Access Locksmiths (Leeds) Ltd - Always the first choice. KEY CUTTING with walls full of key blanks, we very rarely come across a key we cannot cut. We can even cut most transponder car keys. KEYS CUT TO CODE for when you’ve lost your locker or desk key, we have the software to cut thousands of keys to code. A HUGE RANGE of locks from the smallest padlocks to full length UPVC locking mechanisms. KEYING ALIKE FACILITIES on many locks. If you require front and back doors on the same key, or padlocks for your shed we offer same key convenience on many of our products. MAKING KEYS TO LOCKS have a really old lock that has been discontinued for years? Or is even older, and been in the family for generations? Don’t give up on it, we may be able to cut keys to it for you. A COUNTER NOT JUST FOR TRADE we have lots of trade customers, but our experienced staff are there for anyone who walks through the door and come in regularly enough, you’ll see the same faces every time. THOUSANDS OF PRODUCTS from the obvious to the not so obvious. Small cupboard locks, insurance approved safes… our range needs to be seen to be believed. FITTING LOCKS whether you need an additional mortice lock fitting or a yale lock for that extra piece of mind we offer a full fitting service. Neat, tidy, and most importantly to us… more secure. REPLACING LOCKS If you’ve just moved homes, had your keys stolen or just worried about who has a key our vans are stocked with locks to replace there and then whatever the reason. UPGRADING LOCKS worried your locks don’t meet insurance standards? Our knowledgeable locksmiths can advise you on the best way to make your home the most secure it can be. GAINING ENTRY losing keys if more common than you might think, so our locksmiths can get you into your home quickly and efficiently and replace the locks if needed. SUPPLY AND FIT DIGITAL LOCKS for when you need to limit access, but don’t want to have to change a lock and cut keys every time. We have a large range to suit all needs from single doors to office blocks. UPVC PROBLEMS with so many UPVC doors these days, we can change the barrels or the whole locking mechanism depending on what has gone wrong. Failed mechanism and the door locked? Let us help you get in. And this is only a glimpse of what we can offer. We have been making Leeds more secure since 1990, and have done work for the biggest names in the area. As an Avocet ABS Elite Centre we are leading the fight against the criminals snapping the Euro Profile Cylinders, both in the shop and on the road. Our aim is to make you feel more secure, and in all the years we’ve been around we’ve taken on jobs as small as changing an ornate cupboard lock to jobs as large as supplying a Medical Centre with a complex Master Keyed system. We are here for YOU, so please contact the shop for any security needs. We’re a small family run business, and nothing pleases us more to see the same faces coming back week after week, month after month, year after year. With over 40 years of experience between the staff, you know you’re in good hands.